Daily Mirror - Who is afraid of Deshapriya? Who is afraid of Deshapriya? Is there any hurdle to hold PC elections under PR system? 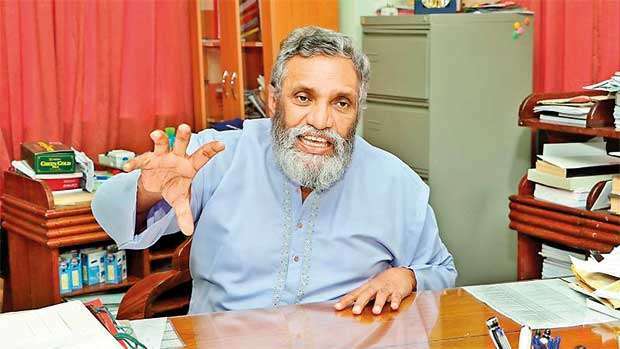 The threat on Monday by Chairman of the Elections Commission Mahinda Deshapriya to resign if Provincial Council elections were not held before the Presidential Election is an indication of his Commission’s helplessness. In a way, it also points to the degree of ‘Independence’ of the Independent Elections Commission. The Elections Commission Chief responding to journalists questioned them in return as to whom they were suggesting to bring to book for not holding Provincial Council Elections. And ironically, now the journalists have to ask that very Elections Chief as to who he was expecting to hold the PC elections before the Presidential Election. And he seems to think that whoever was responsible for the delay in holding PC elections would be moved by his threat and take prompt action to hold those elections. Last Friday’s adjournment debate showed who the culprits were behind the PC election delay. The debate was on the election delay and it ended abruptly for want of quorum - 20 out of 224 members of Parliament. One might argue that the United National Party (UNP) wanted to disrupt the debate since one of the UNP members had raised the quorum issue in the House. But what matters was not the person who raised the issue, but why members from both the government and the Opposition failed to attend to such an important debate. The same thing happened with respect to the Local Government Elections as well. The head of the delimitation review committee on Local Government election Asoka Peiris had told during a newspaper interview that both the Government and the Opposition pressurized him to delay the delimitation process. If one goes through the approach by the UNP-led Government’s attitude towards the Local Government and Provincial Council Elections, it would be very clear that the Government has not only been evasive with elections but also has deliberately taken action to delay those elections. It was during President Mahinda Rajapaksa’s tenure, in 2012 that the Local Government Elections Amendment Bill, which provided for the elections under the mixed electoral system, was passed. Although the Rajapaksa Government had appointed a Delimitation Committee, its report was handed over to the Local Government Minister in 2015, only after the so-called Yahapalana Government assumed office. Since there had been shortcomings in the delimitation report, the new Provincial Councils and Local Government Minister Faiszer Musthapha appointed a Delimitation Review Committee under the chairmanship of Asoka Peiris, which had to hand over its report in January 2016. However, the new committee dragged on till January 2017 and Chairman Peiris attributed the delay to the Government’s failure to provide the necessary support such as the translators. It was during this delay that he alleged that both the government and the Opposition wanted him to delay the elections. Ridiculously, it was only after another 13 months that the Government was able to hold the Local Government Elections. The delay had cost the ruling UNP and the Sri Lanka Freedom Party (SLFP) dearly. Both parties were handed a humiliating defeat. The Sri Lanka Podujana Peramuna (SLPP) unofficially led by former President Mahinda Rajapaksa swept the electorate by capturing more than 230 out of 340 Local Government bodies. The Government even before that defeat had taken action to delay the Provincial Council Elections as well. In September 2017 the Government was to adopt a Bill called the 20th Amendment to the Constitution, which provided for the elections for all nine Provincial Councils to be held on the same day, instead of holding them on a staggered basis. However, the Supreme Court said that the Bill would delay elections for some Provincial Councils which the court ruled illegal. Then the government abandoned the Bill. However, the Government in the same month presented another Bill, Provincial Councils Elections Amendment Bill in Parliament to make 30 per cent of female representation mandatory. While the Committee Stage debate on the Bill was on, the Government sneaked in an Amendment to the Bill, which provided for the mixed electoral system for the Provincial Councils. In a practical sense, the amendment needed postponement of Provincial Council Elections for want of a delimitation process. Thus, the Government achieved what it failed to achieve through the 20th Amendment -the postponement of provincial council elections. On the 27th of the same month, the term of office of the Sabaragamuwa Provincial Council lapsed and that of Eastern and North Central Provincial Councils ended on October 1 and 2 in the same year respectively. The terms of another three councils, namely Central, North Western and the Northern Councils expired on October 9,10 and 25 last year and thus elections for six councils are due now but cannot be held since the delimitation process has not been completed. Meanwhile, the terms of the Western and Southern Provincial Councils are to end on April 22 this year and the tenure of the Uva PC will expire on October 19. A Delimitation Commission for provincial councils was appointed under the Chairmanship of K. Thavalingam, the former Surveyor General which handed over its report to Minister Mustapha in August last year. However, since Parliament failed to ratify it with a two-thirds majority vote, a review committee headed by Prime Minister Ranil Wickremesinghe was appointed as per the law. But the committee has failed to hand over its report to the President in two months provided by the law. Thus, the elections for the six councils the terms of which have lapsed are being dragged on. Even before the Thavalingam Report was handed over, in the light of the experience gained at the Local Government Elections held on February 10, last year, political parties started to demand that the Provincial Council elections should be held under the old Proportional Representation (PR) system. An all-party discussion was also held on August 1, last year at the Temple Trees, the official residence of the Prime Minister on the matter. Now, there seems to be unanimity among political parties on holding the provincial council elections under the PR system. Yet, there are two theories on holding elections under the old system. Some parties are of the view that the law has to be changed for it while some others opine that it can be done right away as the new system comes to operation only after the delimitation process is completed. "The head of the delimitation review committee on Local Government election Asoka Peiris had told during a newspaper interview that both the Government and the Opposition pressurized him to delay the delimitation process"
An idea similar to the second theory had been expressed by the former Minister Musthapha as well in 2017, in respect of Local Government Elections. And no political party or individual countered that argument then. But, who is going to implement it, if the Government is not interested in holding elections at all?